Each week, we grill around 4-5 lbs of chicken breasts to eat during the week. We also sometimes grill a pork tenderloin. 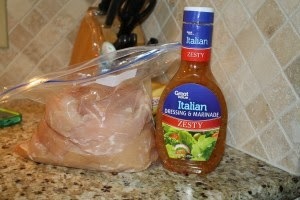 I first trim the chicken and then put it into a big ziplock bag with half a bottle of Italian dressing. 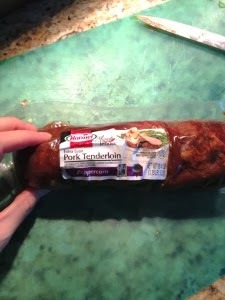 Here’s a picture of our favorite type of tenderloin. Once it’s cooled, we use it to make lunches with for the week, plus we usually have some one night for supper and also some for snacks. *We use a veggie basket to cook any vegetables that we are fixing that week. It’s perfect for peppers and onions- our favorites! 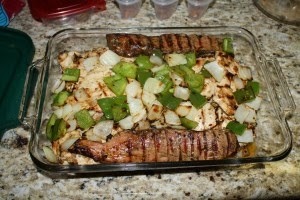 You can also cut it into strips then freeze it for future meals. If you decide to do this, cut it into strips, then place the strips onto a cookie sheet. Freeze the chicken and then once it’s completely frozen solid, transfer the strips to a freezer bag. You can take out the amount that you need for a quick meal and then keep the rest frozen.